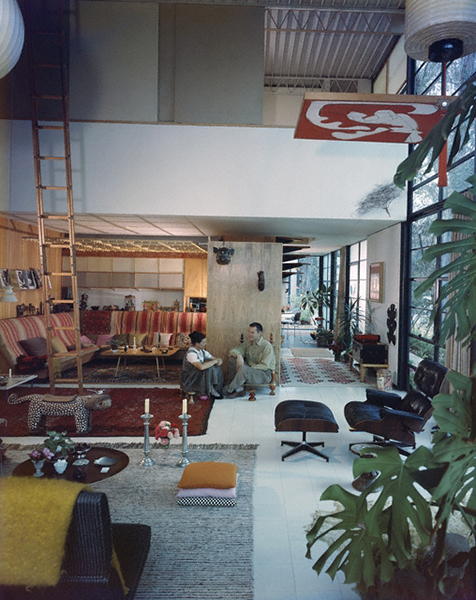 Ray and Charles Eames in their living room, Pacific Palisades, 1968. 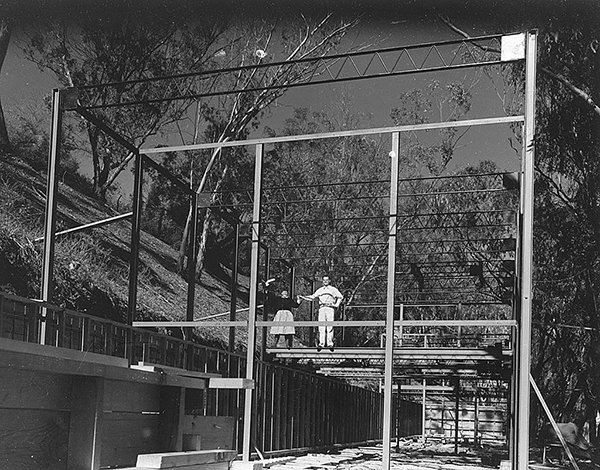 Image courtesy of the Getty Research Institute; photograph by Julius Shulman,. Mid-century modern design continues to be both critically acclaimed and commercially coveted, and Charles and Ray Eames remain its brightest American luminaries. Their furniture pieces for the Herman Miller Company, including their lounge chair and ottoman set and their molded plastic rocker, are still available for sale at the chi-chi furniture store Design Within Reach, and images of and references to their work frequently pepper the pages of smart magazines like Dwell. The Eameses are now the subject of a new documentary, Eames: The Architect and the Painter, shown recently at the Northwest Film Forum. The married couple also features prominently in a pair of current exhibitions: the Bellevue Arts Museum’s George Nelson: Architect, Writer, Designer, Teacher and the extended run of Eames Designs: The Guest Host Relationship, part of Pacific Standard Time’s celebration of post-war Los Angeles art at L.A.’s Architecture and Design Museum. The couple pose for a photograph as their house goes up in 1949. Image courtesy of the Library of Congress. What is their lasting appeal? Wanting to learn more about the Eameses and their work, I sought out their short 1955 film, the wonderful House: After Five Years of Living. Often when we speak about art, we talk about the hand of the artist in the piece, finding works by famous masters worthy of the kind of worship relics of saints once inspired in the medieval devout. Although the Eameses were so often photographed alongside their work, in their film they are not pictured. Their hands, though, are everywhere — in the dishes, potted plants, table linens, figurines, jewelry, fruit, cameras, and recording equipment they have lovingly amassed and arranged. The film is a study in pattern, finding parallels between textiles and shadows of outdoor plants cast on wall screens and similarities in a spiral staircase that fans open and the petals of blossoming roses, daisies, daffodils, and ranunculuses shown elsewhere. The images that make up the film, mostly snapshots taken over the five years Ray and Charles had lived and worked in their Pacific Palisades house and studio, are themselves a collection that picture these other collections. The house is likewise a kit of parts, made up of commercially available steel frames, glass, and colorful panels. Watching the film, however, we learn very little about the building’s structure aside from an opening sequence. Instead, the viewer sees the home as a stage for gracious domestic life. Elmer Bernstein’s accompanying music, in turn, underscores the environment as both a source of energy and a site for repose. Architectural historian and theorist Beatriz Colomina has written extensively and compellingly about modern architecture being produced in media and as media. Indeed, the Eames house was number eight in the Case Study House Program, a collaboration among architects, writers, photographers, furniture-designers, commercial manufacturers, and graphic artists to promote modern design as the mid-century American household aesthetic of choice for John Entenza’s Arts and Architecture magazine. Four years after their 1955 film, the Eameses would go on to produce another film, Glimpses of the USA, for the 1959 American exhibition in Moscow. The show was organized by George Nelson and is remembered, often, as the site of the famous “Kitchen Debate” between Vice-President Richard Nixon and Russian premier Nikita Khrushchev. Projected on seven suspended screens, the Eameses’ film was an information-packed mosaic of still and moving images designed to communicate the abundance and desirability of post-war American life. A playful moment for the Eameses at home, c. 1970. Image courtesy of KPBS TV. The Eameses have proven an abiding model for American domesticity. They lived out the duration of their lives in their 1949 house and together ran a successful design office. They appear as kindred spirits who seamlessly married their work and lives. They seem never to have met a camera they didn’t like. Ray, who had studied painting with influential artist and teacher Hans Hofmann, was known for her talent for color and arrangement, while Charles had a background in set design for the MGM film studio. In their capable hands, objects and spaces became malleable elements of a backdrop for comfortable living. In my favorite clip from Eames: The Architect and the Painter, Pritzker Prize-winning architect Kevin Roche describes attending a dinner party at the Eameses’ home. In lieu of sweets at the end of the meal, Ray offered guests displays of flowers, arranged for their visual and, perhaps, olfactory pleasure. In his telling of the story, Roche recalls his exasperation, but the anecdote is a delightful one: a thwarting of expectations and an appreciation of the ephemeral. The final image of the Eameses’ 1959 Glimpses of the USA pictures forget-me-not flowers. 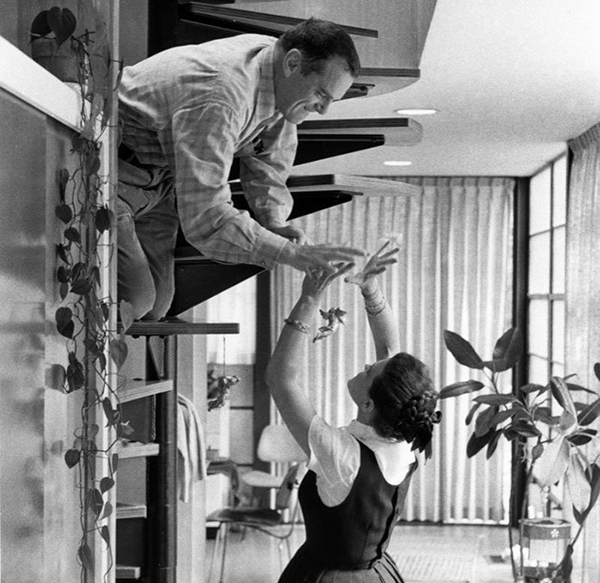 Gone though they are, how, indeed, could we ever forget the Charles and Ray Eames? George Nelson: Architect, Writer, Designer, Teacher runs through February 12th at the Bellevue Arts Museum. Eames Designs: The Guest Host Relationship will be up at the A + D Museum in Los Angeles through February 20th. Be sure not to miss the rapper Ice Cube celebrating the Eameses and their house in this excellent short film.